Our gentle Warrior - is mostly Belgian. and a small amount of Arabian and Paint. Warrior is one of our best stallions. He consistently throws correct, well built foals with wonderful temperments. He is regal, yet gentle and willing to do whatever is asked of him. He's a gentleman with the ladies, and takes his job as stallion very seriously. He has rarely left a mare open and always takes very good care of his herd. We find that breeding him to our Arabian mares, creates the perfect sport horse cross. These foals are tall, well boned with good muscle, but not extremely heavy. You can see the daft influence, but only enough to provide, height and strength. The arabian contribution provides heart, stamina and agility, perfect for any sporting discipline - jumping, eventing, dressage, ect! We often breed Warrior to our draft mares as well - these foals usually end up almost full draft size, but are just a little slighter. Warrior throws about 60-70% colour, thus providing us with a variety of spotted draft off spring. 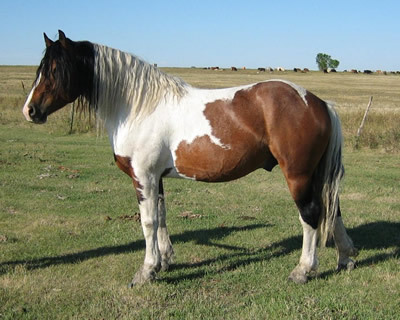 These foals are usually extremely loving and docile, perfect for trail riding, working cattle and under harness. Hard working and willing these foals like to work with people.